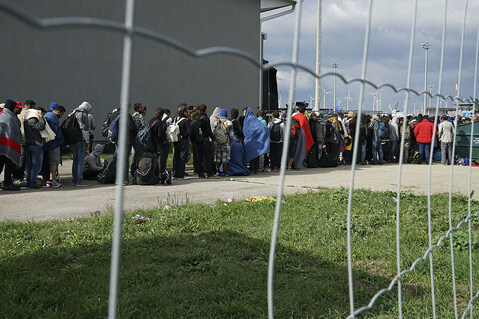 Syrian refugees hoping to cross the Hungarian-Austrian border on their way to Germany in September. More than 4 million Syrians are seeking refuge outside their drought-stricken and war-torn country, but the U.S. may not be among their new homes. On Thursday, the House of Representatives voted 289 to 137, with nearly 50 Democrats supporting the legislation, to require the directors of the FBI, Homeland Security, and national intelligence to confirm that each applicant from Syria and Iraq poses no threat of terrorism to the U.S. The legislation adds a seemingly insurmountable bar to current rules, which have admitted fewer than 2,000 Syrian refugees, 76 percent of whom are women and children, according to Rep. Lois Capps’s office. The extensive vetting process now takes 18-24 months before they are allowed into the country, requires proof of identity, and only allows applicants who raise no security flags. Capps voted in the minority against the legislation — HR 4038, or the American SAFE (Security Against Foreign Enemies) Act — and supporters of the bill amplify the sentiments recorded by a Bloomberg poll taken after the Paris shootings. When asked if the U.S. should accept Syrian refugees, 53 percent of the 628 U.S. adults polled said no. As many as 11 percent agreed with Republican presidential hopeful Ted Cruz that only Christians from Syria should be admitted. More than two dozen governors are widely reported as saying they would block refugees from their states, though they lack the authority to do so.